Is Our Luck Running Out on Oil Supplies? 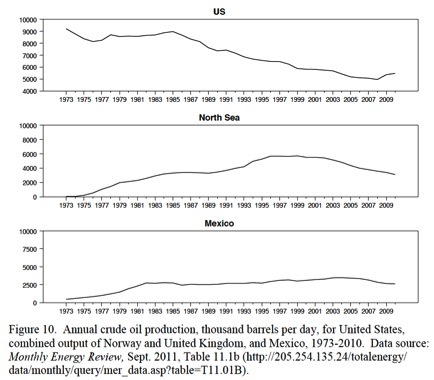 In an excellent new paper, Jim Hamilton asks whether the “phenomenal increase in global crude oil production over the last century and a half” reflects technological progress or good fortune in finding new reserves. The two aren’t completely distinct, of course. Better technology helps find more resources. But the heart of the question remains: have we been lucky or good? My reading of the historical evidence is as follows. (1) For much of the history of the industry, oil has been priced essentially as if it were an inexhaustible resource. (2) Although technological progress and enhanced recovery techniques can temporarily boost production flows from mature fields, it is not reasonable to view these factors as the primary determinants of annual production rates from a given field. (3) The historical source of increasing global oil production is exploitation of new geographical areas, a process whose promise at the global level is obviously limited. Most economists view the economic growth of the last century and a half as being fueled by ongoing technological progress. Without question, that progress has been most impressive. But there may also have been an important component of luck in terms of finding and exploiting a resource that was extremely valuable and useful but ultimately finite and exhaustible. It is not clear how easy it will be to adapt to the end of that era of good fortune. These arguments should be familiar to anyone who’s followed the peak oil debate, but Jim brings a welcome rigor to the discussion. And he discusses how oil prices affect the economy. All in all, a great survey. P.S. If you are interested in the details, Jim’s post over at Econbrowser sparked some thoughtful comments. Twenty-five years ago today, President Ronald Reagan signed the Tax Reform Act of 1986 into law. Happy silver anniversary, tax reform! Over at the Tax Policy Center, Len Burman and Gene Steuerle, both Treasury staffers at the time, and Howard Gleckman, who covered the proceedings for BusinessWeek, offer personal reflections on how TRA86 happened and what that means for today’s efforts. If there is any lesson from TRA86, it is that real reform requires channeling forces and information in the right direction. Put more broadly, it isn’t helpful to try to recreate historical circumstances to get the same outcome. It is far more useful to understand how to convert luck into serendipity to increase the odds that good things will happen. In a recent testimony and a Tax Notes article, I outlined ten steps that increased the chances of reform in 1986 and for the most part are repeatable today. These include; seize today’s, not yesterday’s opportunities; rely on principles like equal justice under the law to determine what should be done; make reform comprehensive, in part, because the political cost is likely to be the same in any case; shift the burden of proof to those opposing the better system; form liberal-conservative coalitions in areas where both sides can gain something; plan strategies in advance for how to best present the proposals and their effects to the public; empower nonpartisan staffs like Treasury’s Office of Tax Policy and the Joint Committee on Taxation (who really assembled the ’86 reform); establish leadership on a variety of fronts; insure accountability so that very specific political leaders bear a significant cost if reform fails; and empower someone to run with the ball and strategize on how to make reform happen. In 1984 through 1986, much of the political leadership came late to the game. And some of the lessons of 1986 were learned, not planned. For example, one key to passage was that at each step in the process, first Treasury Secretary Don Regan, then House Ways & Means Committee Chair Dan Rostenkowski, and finally Senate Finance Committee Chair Bob Packwood feared they would be blamed if the bill failed. As a result, each worked extremely hard to make sure that tax reform did not die on their watch. Tax reform has never been more necessary, it’s hard to see a solution to our budget problems without it, and it’s just impossible. Tax reform will make nearly everyone mad. Big-bucks subsidies will be slashed or killed. Political demagoguery will run wild. The Reagan Administration saw that reform would only work if it began with a very specific plan that the White House owned. And President Reagan eventually became its best salesman. My Tax Policy Center colleague Gene Steuerle—who helped write TRA 86—always says the secret to success in Washington is writing the first draft. Put it this way: President Obama’s health reform strategy, which left the dirty work to Congress, is not the way to go. And what is that 5x interest rate? Just one percent. Such are times–and bank marketing–when short-term rates are almost zero. We are going to keep Netflix as one place to go for streaming and DVDs. This means no change: one website, one account, one password … in other words, no Qwikster. As a long time subscriber, I can only say Hallelujah. Reed Hastings is not a man who gets locked in by sunk costs: he’s willing to kill projects … even if he’s got years invested in them. That’s a real strength. I am sure he regrets the decision to move toward Qwikster, but kudos to him for reversing course. Why Did Sargent and Sims Win a Nobel Prize? 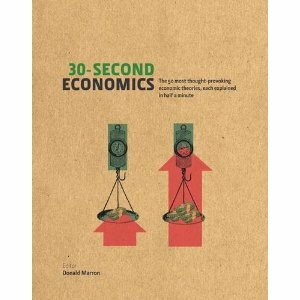 Because they developed methods to help distinguish between cause and effect in the macroeconomy. The economy is constantly affected by unanticipated events. The price of oil rises unexpectedly, the central bank sets an interest rate unforeseen by borrowers and lenders, or household consumption suddenly declines. Such unexpected occurrences are usually called shocks. The economy is also affected by more long- run changes, such as a shift in monetary policy towards stricter disinflationary measures or fiscal policy with more stringent budget rules. One of the main tasks of macroeconomic research is to comprehend how both shocks and systematic policy shifts affect macroeconomic variables in the short and long run. Sargent’s and Sims’s awarded research contributions have been indispensable to this work. Sargent has primarily helped us understand the effects of systematic policy shifts, while Sims has focused on how shocks spread throughout the economy. One difficulty in attempting to understand how the economy works is that the relationships are often reciprocal. Is it policy that influences economic development or is there a reverse causal relationship? One reason for this ambiguity is that both private and public agents actively look ahead. The expectations of the private sector regarding future policy affect today’s decisions about wages, prices and investments, while economic-policy decisions are guided by expectations about developments in the private sector. A clear-cut example of a two-way relationship is the economic development in the early 1980s, when many countries shifted their policy in order to combat inflation. This change was primarily a reaction to economic events during the 1970s, when the inflation rate increased due to higher oil prices and lower produc- tivity growth. Consequently, it is difficult to determine whether the subsequent changes in the economy depended on the policy shift or on underlying factors beyond the control of monetary and fiscal policy which, in turn, gave rise to a different policy. One way of studying the effects of economic policy would be to carry out controlled experiments. In practice, however, varying policies cannot be randomly assigned to different countries. Macroeconomic research is therefore obliged to use historical data. The laureates’ foremost contribution has been to show that causal macroeconomic relationships can indeed be analyzed using historical data, even in cases with two-way relationships. There are good reasons to believe that unexpected shifts in economic policy may have other effects than anticipated changes. It is not trivial, however, to distinguish between the outcomes of expected and unexpected policy. A change in the interest rate or tax rate is not the same as a shock, in the sense that at least part of the change might be expected. This is a longstanding insight in the context of the stock market. A firm which reports improved earnings and higher forecasted profits might still encounter a drop in its share price, simply because the market expected an even stronger report. Moreover, the effects of an unanticipated policy shift might depend on whether it was implemented independently of other shocks in the economy or was a reaction to them. Sargent’s awarded research concerns methods that utilize historical data to understand how systematic changes in economic policy affect the economy over time. Sims’s awarded research instead focuses on distinguishing between unexpected changes in variables, such as the price of oil or the interest rate, and expected changes, in order to trace their effects on important macroeconomic variables. The questions which the laureates have dealt with are obviously interrelated. Although Sargent and Sims have carried out their research independently, their contributions are complementary in many ways. Jeffrey Gettleman has penned a fascinating piece about the 388-day ordeal of two British sailors taken hostage by Somali pirates. Writing in the New York Times Magazine, he recounts how Paul and Rachel Chandler sailed off course between the Seychelles and Tanzania and found their sailboat boarded by ten pirates. Their first order of business? Eating the Chandler’s cookies and using their shower. Piracy is not a glamorous occupation. In recent years, as ransoms have climbed, thousands of destitute, uneducated Somali youth have jumped into the hijacking business, and all anyone in Adado knew was that a young upstart named Buggas had taken the Chandlers to a desiccated smudge of a town called Amara, near the coast, and that Amara locals were backing him up. Local support is crucial, because holding hostages — especially for a long period — can become expensive. You need to keep them fed and most important, heavily guarded — so a rival pirate gang or Islamist militia doesn’t rekidnap them. Paul figures it was costing Buggas nearly $20,000 a month to hold them hostage: with around $300 per day spent on khat; $100 a day on goats; maybe a couple hundred more for tea, sugar, powdered milk, fuel, ammunition and other supplies. Then there’s payroll— in the Chandlers’ case, cash for the pirate raiding party and their 30 henchmen who rotated as guards on shore. On top of this come the translators, who charge a hefty fee to interact with the hostages and negotiate a ransom. Pirates tend to operate on credit — borrowing all these resources from community members or other pirates, who will then get a cut, or in Somali, a sami, once a ransom is delivered. In Amara, rumors quickly began to fly that the Chandlers were rich — possibly even British M.P.’s — and were therefore the ideal sami opportunity. According to lawyers who handle piracy cases, pirate translators tend to be educated men from within the community who work for several different pirate gangs and are typically paid a flat fee, which can reach $200,000 — they are essentially white-collar pirates. Members of the British Somali community took an active interest in the Chandler’s plight and started leaning on folks back home to release them. But Buggas and the gang didn’t budge. They needed their money. Their operating expenses were growing daily, and by this point they had many creditors — some of them heavily armed — who were expecting to be paid back. In many Somali piracy cases, a committee of investors or creditors fronts the cash for the piracy mission, and it’s up to the head gunman to deliver a tidy profit. But finally it seemed to dawn on Buggas and his creditors that they weren’t going to make much of a profit on this one. Stephen and Ali were negotiating a payment under a half-million dollars, all the Chandler family could afford and, for the pirates, a humiliating fraction of what corporate shipowners typically pay. The whole article is worth a read, particularly for the description of the key role that Somalis in Britain played. And, of course, all the usual issues about the incentives created whenever ransoms are paid.